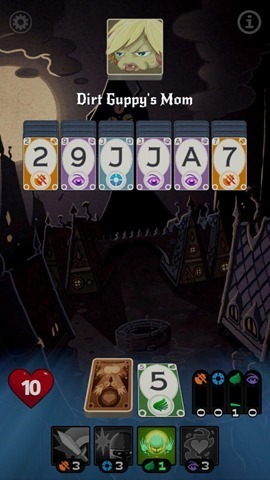 Solitairica is a popular roguelike RPG card game, which is available for PC, and was released on the iOS App Store a few months ago. And now, the developers of the game, Righteous Hammer Games have released Solitairica for Android devices. 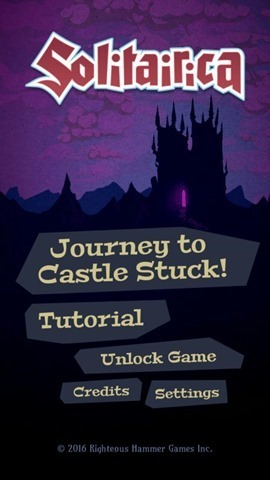 The gameplay is similar to a dungeon crawling RPG, very much like Dungelot. But Solitairica is a bit more polished. The game has hilarious enemies, with crazy powers. You play as a champion un the land of Myriodd, and your quest is to defeat Emperor Stuck, to get the hearts back from him. 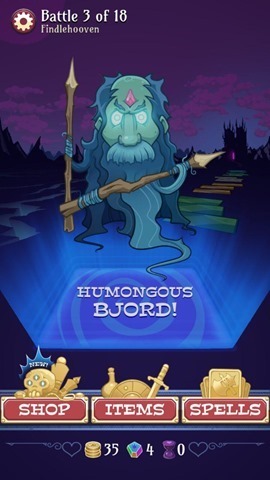 There are a lot of levels in this turn based card game, which features one enemy per level. You must play a number which is 1 more or 1 less than the number shown on the cards in the deck. This will destroy the card, and in turn fill up one of the four energy meters in the bottom right corner. (Attack, Defense, Agility, Willpower). These energies are used for special powers called spells. 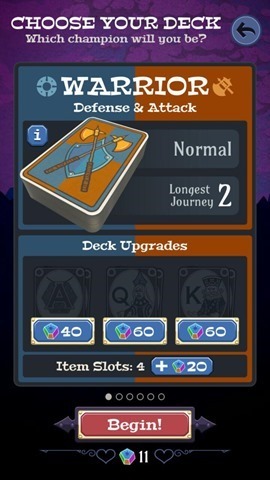 There are 4 corresponding spells, for example the Warrior deck has attack, armor, peek at next card on deck, and heal. Your objective in each level, is to clear the deck of cards on the top. which defeats the enemy of that level. If your card does not match the 1 less or 1 more requiement, for example if you have 5 and the cards on the deck are King, Queen, 10, 8, 3, you can't play the card. Pick a new card to play, but this tume your turn ends, and your enemy will play, i.e., the monster uses an attack or an ability. The game continues till you are defeated, after which you have start from the first level. But you will gain coins and wildstones on each journey. Coins can be used for buying items, spells, while the Wildstone cards can be used for upgrading cards, and unlocking new decks. 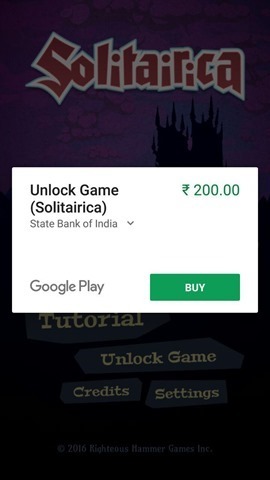 There are 5 decks in the game, and you can unlock them all with windstones or buy them for a time in-app purchase of Rs.200.